Country Humor & Mostly True Stories from the Farm You know you are a farmer when: • Your daughter, working part-time at McDonald’s, makes twice as much money as you do. • You drive a 275,000 tractor and a 500 car. • You would love to see an animal rights activist’s Chihuahua eaten by a coyote. • You look forward to retirement because your income will go up. As a farmer since 1965, author Marvin Jensen gets it. He gets the financial and familial hardships that come with being a commercial farmer, which may or may not have contributed to his self-proclaimed eccentricity—although his wife prefers the term “mentally deranged.” From livestock and crop farming, to local lore, to even climbing Mount Kilimanjaro, Jensen recalls his farming and life experiences with utter candor and derisive humor. 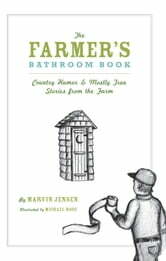 The Farmer’s Bathroom Book is perfect for those with short attention spans, to be enjoyed while working on other, more important things.